Munich has an ambivalent image in other cities. Tons of people say Munich is snobby and rich and that there’s nothing interesting going on there—but if you come here and go to the bars and clubs, you can hear all different kinds of music. There are so many musicians here. It’s worth representing what’s going on here, and through the internet it seems more people are looking to Munich: there’s the label and store Public Possession; there’s Ilian Tape, of course; there’s the clubs MMA and Charlie. We thought in a way it would be important to do something about this reputation—and that’s one reason why we started Radio 80000. Two years ago, we were both working in internships, and we listened to a lot of music during that time. Online radio stations were pretty good for that because you can hear a lot of different stuff. 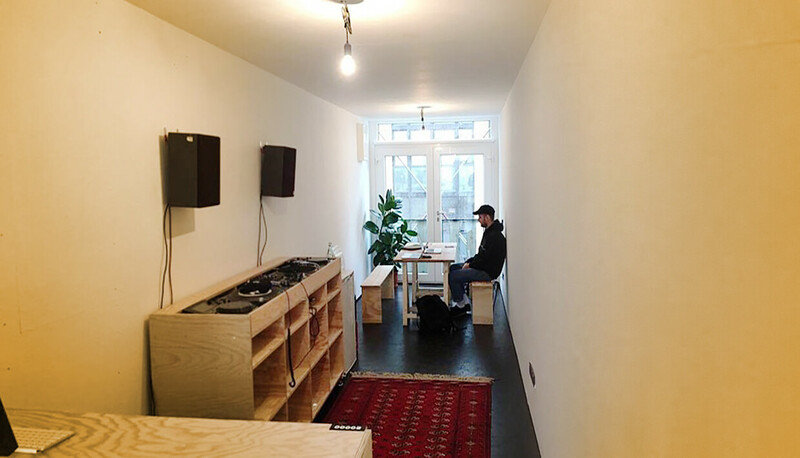 Online radio also provides such an easy way into the scene in a foreign city, so if you want to know what’s happening in London, you can check where the NTS DJs are playing; if you go to Amsterdam you can check out Red Light; if you go to New York you can go to The Lot Radio studio and just talk to people there. But Munich didn’t have anything like that. Everything we consume we eventually want to do ourselves, so we just started: we paid the GEMA and GVL licensing fees from the first day, bought a domain and paid for the streaming service and the server. And since we already ran a podcast series, we knew some DJs from different scenes in Munich who weren’t really represented, and we thought it was worth presenting those scenes to a wider audience. If you think about it, it doesn’t matter where an online radio is located, because you can hear it all over the world. But we wanted to create some kind of community around Radio 80000, so we made Munich the location and the identity. In the beginning we just asked a few friends to do live shows, so there wasn’t really a special vision for the music. The idea is more to create a platform for people in Munich who want to do a show. There are also shows from different cities, but they’re all in some way connected to Munich, because it’s about participating in the local scene. It isn’t a very big scene, so there’s not a big audience for niche music—but you have to participate to make it better. It would have been easy to go somewhere where the scene is already big and powerful, but it’s also interesting to try to make the scene here more interesting. We were always interested in shaping the musical landscape in Munich in some way, in participating. So if there’s a new style of music coming up or a DJs or a club in town, we try to get involved with them and see if they could imagine doing a show with us. We started with only live broadcasts, so for the first year when there were no live shows, you couldn’t listen to the stream on the website—you could only listen to the recordings. After a year we decided to stream for 16 hours per day and fill up the spare time with old shows, so you don’t have to decide what you want to listen to; you can just go to the website and hear whatever’s running. We like that about online radio: you don’t have to decide what to listen to, so you can find out about music you might not have otherwise. That’s one of the major disadvantages of Spotify, for example: an algorithm presents you music that’s based on what you’ve heard and liked before. But we wanted to show people music they might never hear if they decided what to listen to themselves. Now we have about 20 radio hosts—and maybe 25 in the near future because we’re introducing some new shows. We’re always up for new ones if we witness a DJ who’s got a certain style that we don’t already have represented. One of our major goals is at some point not to have to re-stream that much anymore and instead fill up the programming with live shows broadcasted from the studio. It would be great to get to the point where the studio is an offline location where you can meet new people and go there and there’s always good music playing. We actually just moved into our new studio. It’s in a shipping container by the Munich Ostbahnhof. It used to be a huge party area around here where the mainstream clubs were, but they tore all that down and made it into a creative quarter where a bunch of agencies are. And now there’s a little container collective developing, like a village made out of containers—around 15. They’re trying to rent the containers to people who don’t have the money or the means to rent a “real” place, so there’s a graphic design office next to us, a little coffee shop and a workshop for motorcycles. Our container is a collaboration with the guys from Public Possession. It’s a low-budget project right now because the radio is our hobby; we both have day jobs. When we started two years ago, we applied for official funding from the city’s cultural department, but they denied it. Maybe if we tried again right now they’d decide, “Okay, it’s gotten a little bigger and people are talking about it, so now it’s reasonable to fund it.” But Radio 80000 is not commercial, obviously. We don’t do advertisements or anything like that. We had a limited run of merchandise and we have residencies at a bar in Munich and a techno night on Tuesdays at the Academy Of Fine Arts, and those are the sources of income for the radio right now. We can’t yet imaging letting the radio become our day jobs, because our approach is so un-commercial that trying to earn money with it wouldn’t be good for the project right now. We can’t think of a real and cool way to earn money with a radio station without going commercial. Maybe in the future it’ll be different. But it should be the way it is right now: a side project where we can try things out, have fun and build the community. Telekom Electronic Beats is throwing a series of Clubnights in cities around Germany, including at Munich’s MMA club. Find more information here.